2015 Latest 70-432 Real exam questions to master and practice upon! Braindump2go Offers the New Updated Microsoft 70-432 233 Exam Questions in PDF & VCE files that can also be downloaded on every mobile device for preparation! You administer a SQL Server 2008 instance that contains a database named InsightDB. The InsightDB database is used by an application that is continuously connected. The application uses the INSERT command extensively. The application uses triggers to populate multiple tables. You need to ensure that the reports generated by the application using the InsightDB database return current information with minimal negative effects on the application inserts. B. Set the isolation level to Read Uncommitted for the InsightDB database. D. Set the isolation level to Read Committed Snapshot for the InsightDB database. You manage two SQL Server 2008 instances on separate servers named Server1 and Server2. The servers are located in different cities. You use the Resource Governor to manage processor resources on the server for a newly deployed application named App1. App1 is assigned to a custom workload group named MyApp. You need to monitor processor resources. A. Use the request_max_cpu_time_sec column of the sys.resource_governor_workload_groups catalog view. B. Use the sys.dm_os_performance_counters to monitor the CPU usage % counter of the SQLServer:Workload Group Stats performance object for the default workload group. C. Use the sys.dm_os_performance_counters to monitor the CPU usage % counter of the SQLServer:Workload Group Stats performance object for the MyApp workload group. the CPU usage for the default workload group. You administer a Microsoft SQL Server 2008 R2 instance that contains two databases named Northwind2008R2 and AdventureWorks. The Northwind2008R2 database uses the SQL_Latin1_General_CP1_CI_AS collation and the AdventureWorks database uses the SQL_Latin1_General_CP1_CS_AS collation. 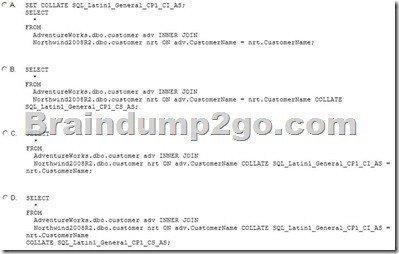 You need to write a query that returns all customers having the same name in each database. You also need to ensure that the query is not case-sensitive.